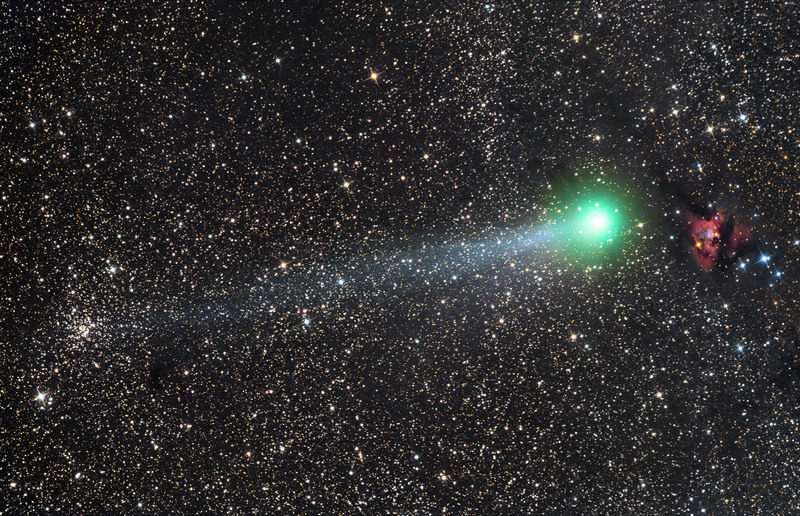 C/2014 Q2 (Lovejoy) was discovered on 17 August 2014 by Terry Lovejoy using a 0.2-meter (8 in) Schmidt–Cassegrain telescope. It is is a long-period comet.By December 2014 the comet had brightened to roughly magnitude 7.4 making it a small telescope and binoculars target. By mid-December the comet was visible to the naked eye for experienced observers with dark skies. This two panel mosaic shows the comet on March 21th 2015, when the comet was between the open cluster NGC 559 and the emission nebula Sh2-187 (LBN 630). Some dark nebulae can be also seen on this image. Hovering the mouse over will show the names of the objects.